The country of Ukraine may be in turmoil right now, but what does their tennis nation look like? For the last few years, the serve and volleyer Sergiy Stakhovsky has carried the flag with 4 main tour titles to his name and a famous win over Federer at Wimbledon in 2013. A clever player on and off court, he’s now 28 with a few good years ahead of him. 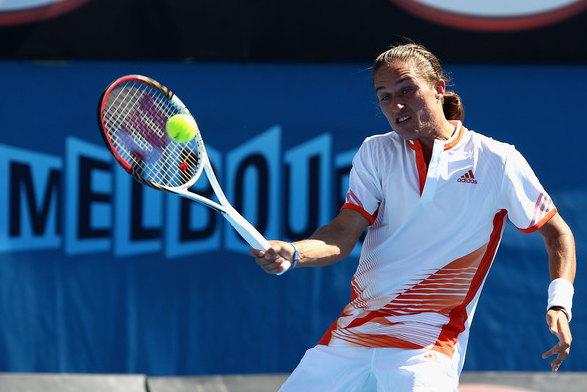 Alex ‘The Dog’ Dolgopolov is not only a new star for Ukrainian tennis but a potential world-wide star. His giant killing win over Nadal at Indian Wells this year put him firmly on the map; with 2 career titles so far, the man from Kiev – with an exciting, wristy game and jack-in-the-box serve – looks poised to attack the top 10 sooner or later. So what’s going on behind them? Illya Marchenko is ranked at 163 but at 26 and with few main tour wins to his name, he’s a journeyman at best.